It’s not quite as harsh as it sounds, but yes, I would like for you to imagine your new venture’s death. Here is why. 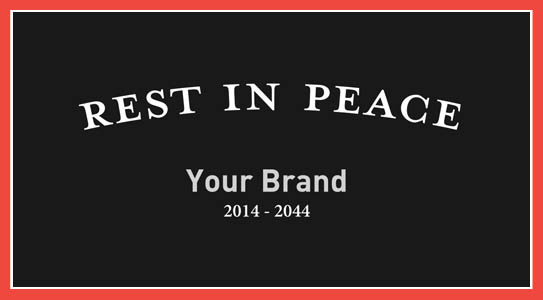 Not a proprietary exercise to my consultancy, writing a memorial speech for your brand during the Brand Foundation stage is a cruel, yet crucial step in defining your brand’s lasting values, and has been a staple in early brand development for many brand strategists. Given that those speeches are short, to the point, and always focus on only the best one has to say about the deceased, it is a great opportunity to dig deeper (did not mean for this pun to happen) into the soul and its bigger, social purpose. A brand can only leave a lasting positive impact if it cared to make a difference in people’s lives. This is why a memorial speech is an extremely fruitful, imaginative, and most of the times rather entertaining exercise to be doing at the very onset of your brand development; and you can rarely say that about a memorial speech. Over time we uncovered a secondary, but equally important finding during the exercise: The realization that you need to ponder about how your venture will die. And that uncovers the real long term vision for your brand: Will it be bought by Costco, improved upon and distributed to the masses? Will it become part of Marissa Mayer’s tech portfolio, giving you a nice financial push (and we don’t quite know what Yahoo! might do with it)? What is your dream, way past your 5 or 10 year business plan? If it has to end, how would you want it to end? That insight will help shape the overall business and brand strategy. And here you thought I wanted to harm your newborn venture, while I want to do the exact opposite – watch it grow through planned retirement towards a happy ending.